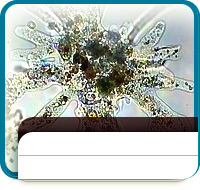 Amoeba proteus - The outstanding example of a potentially immortal unicellular organism. It changes its shape continuously. What at first sight seems to be a chaotic, aimleesly swelling movement turns out to be the formation of lobopodia. Responding to a chemical stimulus it uses chemotaxis to catch its prey, enclose it and ingest it in a food vacuole. 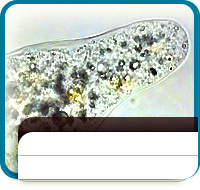 Amoeba (Chaos diffluens) - Cyclosis in a pseudopod (magnification of 1000 times). Viscous, transparent plasm is streaming, followed first by more liquid, granular plasm and then by the nucleus, food vacuoles with ingested food particles, and food-storing crystals. 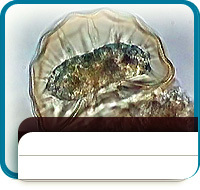 Arcella gibbosa - Shell-forming Amoeba (taken laterally). The soft plasm body is attached to the protecting cupola by plasm strings. Lobopodia are extended through a circular opening on the underside. 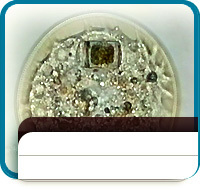 Arcella gibbosa - The circular shell with hexagonal pattern (in top view) showing a young, still transparent specimen (with inclusion of diatom). Gas bubbles can be produced or sucked in to keep balancing in water.